sports fans | six words to change the world. confession: i’ve never been to fenway. Those who know me know that I’m far more likely to know political scores than baseball scores, but come on, I do live in New England. And my journey to being a Red Sox fan is not a long one, but before you judge me and call me a fair-weather fan, hear me out. I grew up with Cal Ripken, the Orioles and Camden Yards. But upon moving to New Hampshire from Maryland my sophomore year of high school (I had one girl say to me, “New Hampshire? Isn’t that, like, up north somewhere?” Yes hun, it is. 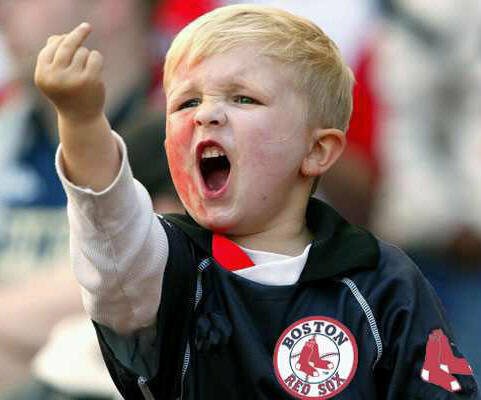 ), I quickly realized that loving the Red Sox was not just a passion some people have; it is a way of life. It didn’t come easily, but after awhile, I began to slowly develop affection for the Sox much like Belle for Beast in the Disney classic, “Beauty and the Beast”. Sorry, I had to throw that in. I spent hours watching the games with friends, a pastime I would never have done as an O’s fan. So I started off slow, just watching the games and learning the personalities of the players. Now, I have lived in NH for six years-and because of this I consider myself to be on the same level as a six-year-old child when it comes to my love for the Red Sox. My dad bought me my first Red Sox hat last year! Hooray! But Mal and I have one thing in common despite our different sides in one of the deepest and longest of rivalries: I have never been to a game at Fenway Park, just as she’s never been to a game at Yankee Stadium. It’s humiliating, but true. I yearn for the day when I can join pretty much every other New Englander and say that I went to Fenway and saw the World Series champions. So, if anyone wants to help me on my journey, give me a call. Take me out to the ball game. I love hot dogs. And beers.